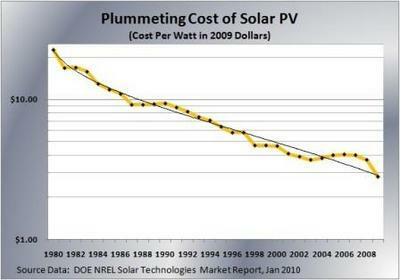 From Ramez Naam writing in SciAm Smaller, cheaper, faster: Does Moore’s law apply to solar cells? Solar may be cheaper than conventional electricity by 2018. This will do many things, (de-carbonization of electricity, etc. ), but it will also help electrification of the fleet. The National Renewable Energy Laboratory of the U.S. Department of Energy has watched solar photovoltaic price trends since 1980. They’ve seen the price per Watt of solar modules (not counting installation) drop from $22 dollars in 1980 down to under $3 today. “The system started with seven horse-drawn vehicles running along regular routes. Each coach could carry six or eight passengers. Some sources specify three routes; others say there were six, and that one of them was a circular route. The Carosses à Cinq Sous, or Five-Penny Coaches, were popular at first, but the novelty soon wore off. The system proved an idea ahead of its time. France was still a feudal society, with the Sun King at its apex. Nobility and gentry were allowed to ride the coaches, but not soldiers and peasants. The bus routes were out of business by 1675. So there you have it: Urban bus service in Paris 250 years before anybody thought to try it elsewhere. I wonder if the routes are mapped anywhere, or if that information is lost to history.